Attention Seniors: BrightStar Care of Summit and Westfield Thank a Nurse! Our Summit and Westfield Nurses are the best! 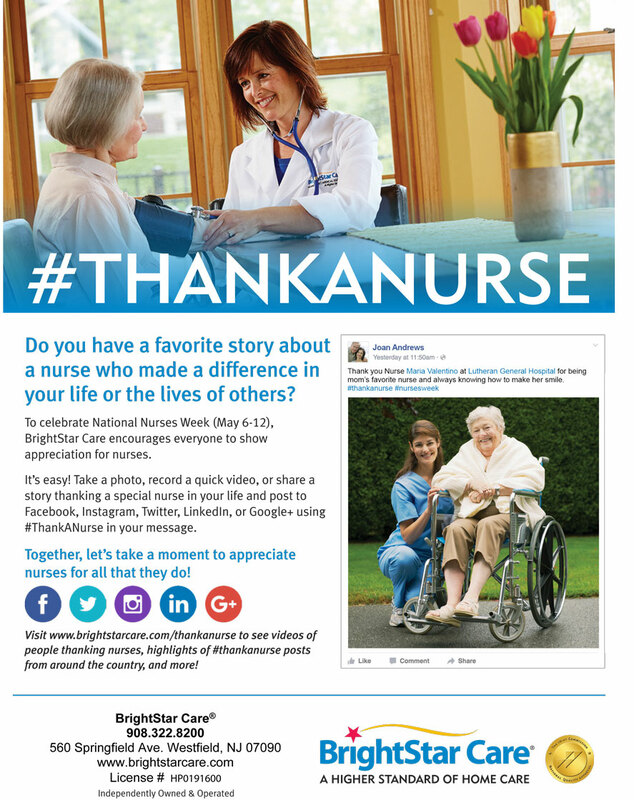 I wanted to take a moment to #thankanurse in our BrightStar Care office. BrightStar Care employees often go above and beyond for their clients, but one of our Registered Nurses, Mary Jones truly went above her call of duty. Originally Mary Jones, RN was assigned to perform a routine Initial Assessment for a new client. Upon meeting the new client Mary Jones became aware that this woman did not have any family locally and was getting discharged from a rehabilitation center and was returning home for the first time in over a year. Mary Jones, RN took on the role of a family member for our client by making sure her home was comfortable and safe for her long awaited return. Every morning Mary stopped by her home to make sure the case was going well and she had everything she needed. Between Mary’s two jobs she found time to run errands for the woman such as grocery shopping and pharmacy runs. Mary put her full heart into this case. Thank you Mary Jones for all of your hard work and dedication to BrightStar Care! BrightStar Home Care of Westfield and Summit proudly provides Home Care and Support for Seniors, including 24 hour in home care, and support in independent and assisted living communities. We provide all levels of home care from Companion sSrvices to Skilled Nursing. Medical Staffing, Home care, In-Home Skilled Nursing, In-Home Physical Therapy for Pediatric, Adult and Geriatric Patients, and Companion and Personal Care for Elders with Alzheimer’s or Dementia. We also provide Home Child Care, Sitter and Nanny services for Children and Support for New Mothers. We Support Veterans as a partner of the VA/Veterans administration provider network and area a Home Care Provider for U.S. Department of Labor, Division of Energy Employees Occupational Illness Compensation. We Accept most Long Term Care Insurance benefits, provide Hospice care, Live-in care, CNA, Caregiver, RN, LPN, RN Supervision, Compassionate Care, and Compatibility Guarantees. We are an ALS Society partner, Alzheimer Association member, providing care for developmentally disabled and individuals of all ages with mental health and behavioral health diagnosis. Other services inlcude safe discharge and transportation from the hospital or rehab facility, Post Op care both short and long term, Pre Operation and preparation help and assistance, client monitoring for out of town family members. Our service area covers Fanwood, Linden, Winfield, Plainfield, North Plainfield, Rahway, Clark, Scotch Plains, Westfield, Mountainside, Berkeley Heights, New Providence Cranford, Garwood, Kenilworth, Springfield, Union, Vauxhall, Elizabeth, Roselle, Roselle Park, Hillside, Elizabeth, Summit in Union County, NJ.